Microsoft Internet Explorer 9 (IE 9) has a new feature called the "Pinned Tabs" that lets you pin a particular website to the Windows 7 Taskbar. Well, along with Pinned Tabs comes another important feature - Website Notifications. However this is available only to Hotmail.com as of now. So, when you pin your Hotmail.com tab to your Windows 7 taskbar in Internet Explorer 9, you will start receiving notifications about new emails and also the count of unread e-mails in your Hotmail inbox right on the Hotmail icon in the taskbar. Check the screenshot above for a better understanding. Step 3. 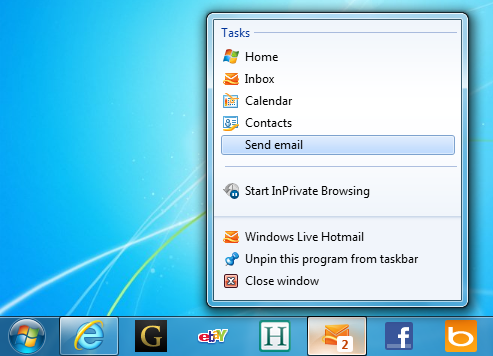 Pin the Hotmail.com tab to the Windows 7 Taskbar. Check this cool tutorial to help you. Done!